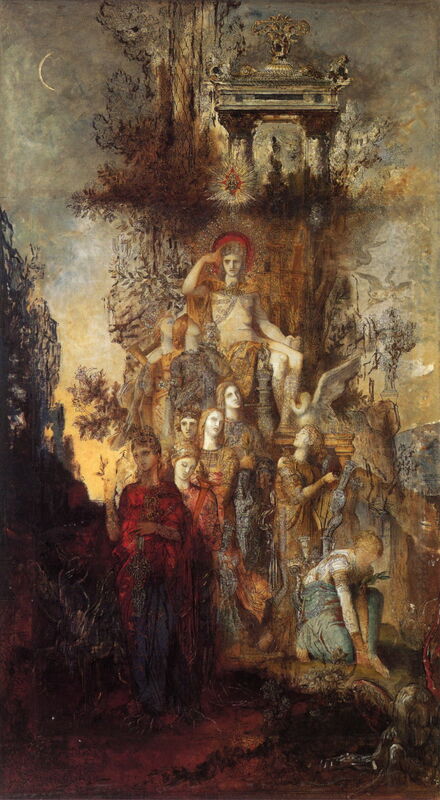 Gustave Moreau (1826–1898), Jason (1865), oil on canvas, 204 × 115 cm, Musée d'Orsay, Paris. Wikimedia Commons. During the 1800s, history, and other forms of narrative, painting underwent a crisis from which they have never really recovered. 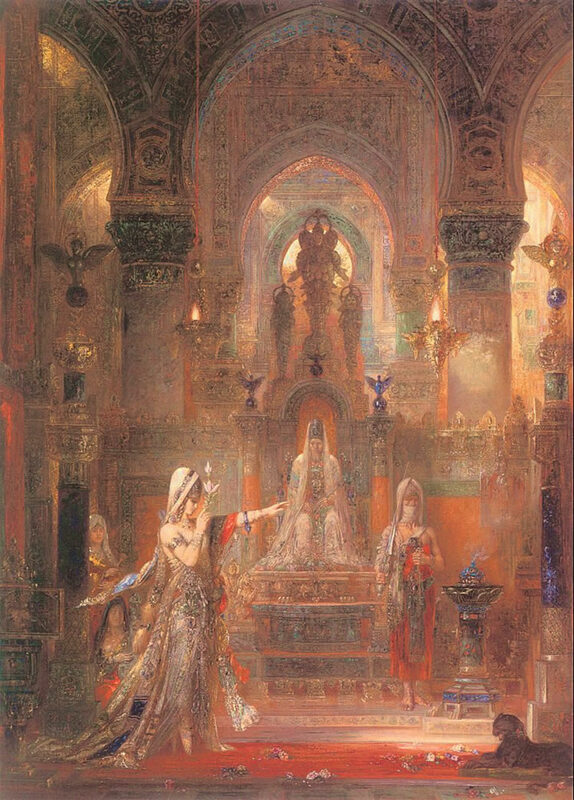 This article looks at the narrative paintings of Gustave Moreau, who rethought the genre. Although now an obscure artist, the paintings which I consider here are of great importance in understanding narrative in paintings, and bear lessons which still need repeating. Born in Paris the year after the death of David, his father was an architect and a man of culture who wished his son to have a sound and classical education. After showing good abilities at drawing, he started copying in the Louvre at the age of 17, and the following year started attending a private atelier run by François-Édouard Picot, to prepare him for the entrance exam for the École des Beaux-Arts in Paris. He succeeded in its entrance exam, and started there as a student in 1846. Primarily interested in history painting, he competed twice for the Prix de Rome, the premier competition for history painting, but was unsuccessful on both occasions. He then left the École des Beaux-Arts in 1849, and returned to making copies in the Louvre, and some small commissioned paintings. In 1851 (the year that JMW Turner died), he befriended Théodore Chassériau, a former pupil of Ingres, and set up his first studio near his. The following year he had his first painting accepted for the Salon, but it did not make significant impact. In 1853, his parents bought him a house to live in, and use as a studio: he moved in, and remained there for the rest of his life; this is now the Musée Gustave Moreau, which he established later in life. From October 1857 to June 1858, he copied Renaissance paintings in Rome, then moved on to Florence, Milan, and Venice. He finally returned to Paris in September 1859. The following year he met his mistress (whom he never married, but remained single) and set her up in a nearby flat, where she lived until her death in 1890. From about 1859, he resolved to reform history painting by developing a new approach. He achieved progressive success in the Salon, although a hostile reception in 1869 stopped him from submitting to the Salon again until 1876. He developed a steady trickle of commissions, and a supportive circle of enthusiastic collectors. He was admitted to the Legion of Honour in 1875, and was elected to the Académie des Beaux-Arts in 1888. Despite his earlier reluctance, in 1891 he took over his late friend Delaunay’s atelier at the École des Beaux-Arts. The following year he was appointed Professor there; among his students were Matisse and Marquet. In 1895 he was a member of the patronage committee for the first Venice Biennale. His museum was finally established under the French State in 1902. Classical teaching at the time stressed the staging of history paintings according to Roger de Piles, and their theatricality in terms of facial expression and gesture, according to Alberti. These combined in what Lessing had termed ‘the fruitful moment’. Poussin had extended this using ‘péripéties’ (adventures or trips), which condensed the causes of the event which was depicted, its consequences and moral implications, into the narrative painting. evocation of an immaterial state which he considers sublime. As the action and calm beauty of the first two were antitheses, this posed immediate problems which Moreau then tried to tackle in many of his works. 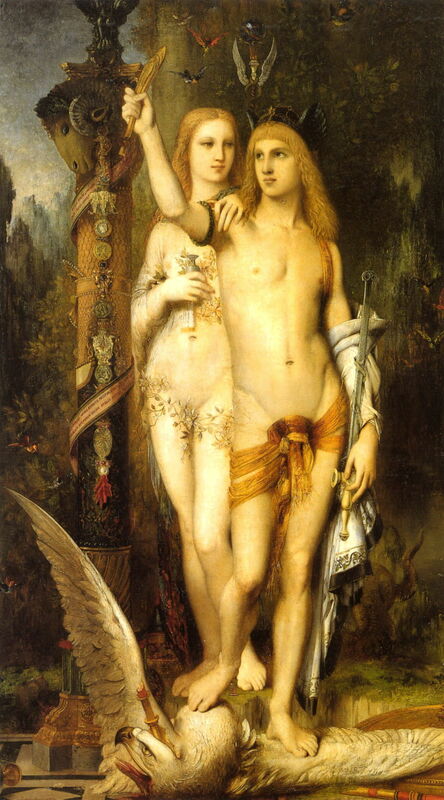 One of Moreau’s early history paintings, his Jason referred to the classical narrative of Jason and the Golden Fleece. When Jason reached Colchis, he underwent a series of trials imposed by King Aeëtes, culminating in Jason’s victory over the dragon which guarded the Golden Fleece. These were accomplished with the help of Medea, the King’s daughter, in return for a promise of marriage. Rather than paint one of the many action scenes from the narrative, Jason is here shown with Medea, and symbolic rather than literal representations of the Golden Fleece and the vanquished dragon. The Golden Fleece is shown by the ram’s head at the top of the pillar behind the couple. The dragon is shown by the winged beast on which Jason’s feet are placed, with the broken tip of a spear impaled in it. This was a departure from the original Greek myth, in which the dragon was put to sleep rather than killed. There are further cues to the mythical narrative too. Among these are the vial held in Medea’s right hand, which refers to past events in which its contents were used to put the dragon to sleep, and in other trials set by her father, and to the poison which she will later administer to Jason’s young bride. It has also been claimed that the flowers decorating her body are the poisonous hellebore, a standard tool of witches. Although more opaque than most narrative paintings, and capable of confounding the critics of the day, Moreau’s Jason succeeds when you know the original narrative well. It falls short of his aims, though, in that it lacks any sort of human action. Gustave Moreau (1826–1898), The Muses Leave Apollo, their Father, in Order to go Forth and Enlighten the World (c 1868), oil on canvas, 292 × 152 cm, Musée Gustave Moreau, Paris. Wikimedia Commons. Several studies exist for this beautiful and intricate painting, but this version in oils remained in Moreau’s studio throughout his life, and he continued to work on it fitfully. In 1882 he started to enlarge the canvas, but that appears to have been completed. Its narrative is extremely simple, and related in its title: the Muses, of epic poetry, lyric poetry, history, song, tragedy, hymns, dance, comedy, and astronomy, are here leaving Apollo (son of Zeus, who was generally held to be their father) to bring inspiration to the human world. Again this painting does not convey any dramatic human action, but does attain Moreau’s other two goals. In the context of his work, it anticipates the increasingly complex paintings which he made later in his career. However in this case its complexities do not (yet) obscure its narrative. 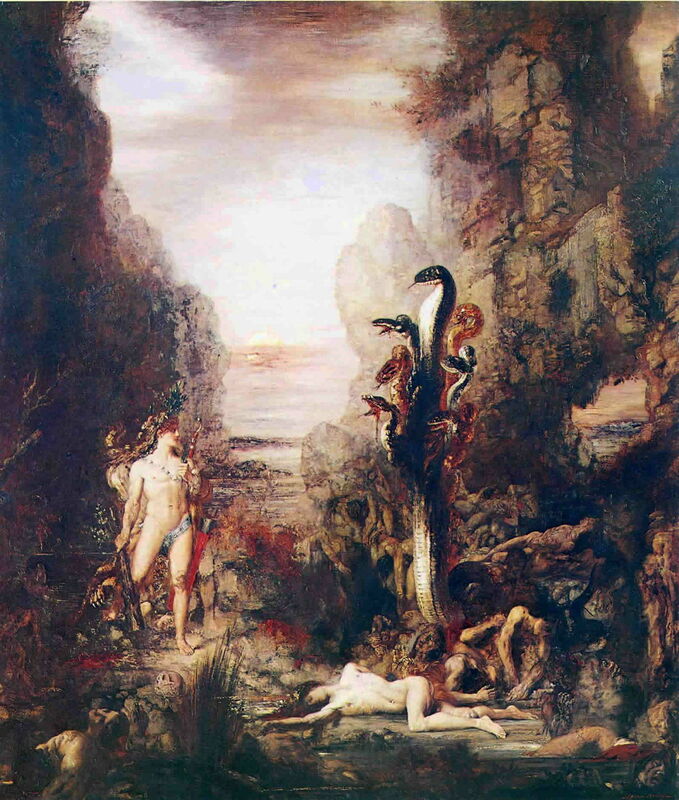 Almost a decade later, Moreau painted another significant Greek mythical work applying his same principles. This refers to one of the twelve labours imposed on Hercules, specifically that of hunting the Hydra in the marshes of Lernea, near Argos, and destroying it. The Hydra was a poisonous monster with the body of a dog and multiple serpent heads, whose breath alone was capable of killing. Although he does not show its dog-like body here, Moreau shows its heads according to the letter of the original story, with the marshes seen behind. Hercules is shown confronting the Hydra, with a charnelhouse of remains of previous victims at its base. Once again, Moreau is only partially successful in his aims, falling short of any dramatic human action. However by providing good cues to the original narrative, the painting succeeds. It has also engendered long-standing controversy over its possible political connotations. It was suggested at the time that the Hydra represented the forces of anarchy behind the insurgency of the Commune in 1871. Others prefer instead that the Hydra represents Bismarck and the German princes behind the Franco-Prussian War of 1870. There do not appear to be any good cues to either. At the Salon of 1876, Moreau showed another even more surprising painting alongside his Hercules and the Lernean Hydra: Salome. This time the narrative is Biblical, and very simple. The unnamed daughter (subsequently identified as Salome) of Herodias performed a dance at a birthday feast thrown by King Herod. The dance so pleased Herod that he offered her anything that she wanted, up to half his kingdom. She asked for the head of John the Baptist, the earthly messenger sent to announce the birth and ministry of Jesus Christ. Reluctantly, Herod agreed, John was beheaded in prison, and his head brought to her on a plate; the dancer gave the head to her mother. There have been numerous paintings showing John’s head being brought on a plate, and related variations, but Moreau’s version shows Salome in her dance before King Herod. In that central narrative and its cues, it is fairly straightforward. Once again, Moreau does not depict any action as such, although here he had ample opportunity to show a dramatic movement in the dance. Instead Salome appears frozen, or at most moving in a dead march. Everything else about the painting, though, is extraordinary, particularly in its fusion of different cultural elements. These have been associated with the Hagia Sophia in Istanbul, the Alhambra in Granada, the Great Mosque of Cordoba, and several mediaeval cathedrals. Motifs have been identified from Etruscan, Roman, Egyptian, Indian, and Chinese art and culture. Moreau’s narrative was starting to become submerged in his exuberant and exotic symbolism. 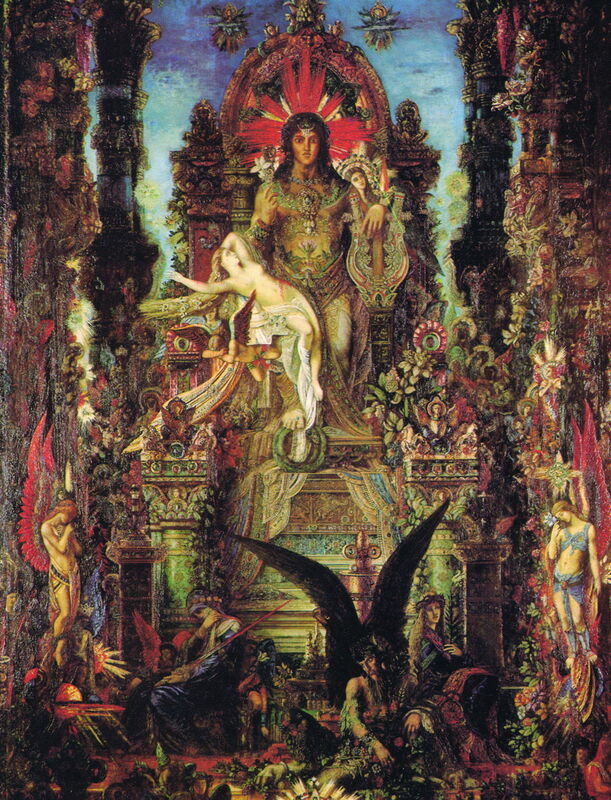 This most elaborate canvas represents the culmination of Moreau’s quest to change history painting. Completed just three years before his death, he appears to have started it over five years earlier. Returning to Greek myth, Moreau uses the story of the god Jupiter and the mortal woman Semele, from Ovid’s Metamorphoses, as the basis. Jupiter made Semele pregnant when he was in human form. His jealous wife Juno tricks Jupiter into an oath which makes him reveal himself to Semele in his full divine form. Even though Jupiter takes his weakest thunderclouds in doing so, this results in Semele’s destruction. Jupiter then takes her foetus and sews it into his own thigh, so that it can then give rise to Bacchus, his son. It is hard to know how much – or, rather, how little – of this painting directly reflects or cues that narrative. Jupiter himself is shown holding a lotus flower in his right hand, and Apollo’s ornate lyre in his left. Semele is draped in mid-air over Jupiter’s right thigh. Beyond that couple there is a cornucopia of religious and cultural figures and symbols which is so excessively rich as to defy narrative or allegorical interpretation. At the foot of Jupiter’s immense throne are at least five substantial figures, who do not appear to relate to any characters in Ovid’s narrative. Indeed, none seems to even come from a period or culture which might have been familiar to Ovid. In this final reckoning, Moreau shows that his original aims were too conflicting to achieve. He consistently has to abandon dramatic human action, and in doing so, his paintings do not express passions. His quest for beauty and the sublime overwhelms narrative, and instead of a new history painting, we see only the dissolution of narrative, and of history itself. Sadly, Moreau did not re-invent the genre, but created his own wonderful phantasmagoric theatricality, more Richard Dadd than The New History Painting. In doing so, I think that he proved the underlying soundness of Alberti and Poussin’s approaches. Posted in General, Painting and tagged history, Moreau, narrative, painting, Prix de Rome, symbolism. Bookmark the permalink. I swear I learn more from these posts than I ever did in my Art History major. Thank you again! I hope that you and others find them both interesting and enjoyable; I greatly enjoy researching and writing these articles too. BT and the largest UK Internet failure?